Q. How Does Plantastic! Work? A. Plantastic! works by slowly releasing its water (at a rate of about 1.5 ounces per day) directly into the plant's soil through the hollow capspike. This slow drip process efficiently moistens the soil and allows the plant to remain green and healthy for two to three weeks or more. Unlike watering from a can or pitcher, Plantastic! 's slow release eliminates run-off, so that 100% of the water is absorbed by the plant's root system. Q. What controls the water release rate? A. Plantastic! uses a unique component, called a Flo-disk, to regulate the release of the water. The Flo-disk is replaceable, so that ordinary tap water may be used without causing Plantastic! to become clogged and useless from the impurities contained in all tap waters. Q. How Do I install the Flo-Disk? A. Place the Flo-Disk, with the brown gasket material facing up (in the direction of the bottle) in the cap spike and gently push it all the way down so it is resting below the threads of the spike. DO NOT ALTER THE FLO-DISK IN ANY WAY! Screw the spike firmly onto the bottle "firmly finger tight". Q. Do I need to do anything to the Flo-Disk to make it work? A. NO! DO NOT ALTER FLO-DISK IN ANY WAY OR IT WILL NOT WORK!. Q.Can the Flo-disks be reused? A. Yes. Depending on the quality of your water, the Flo-disks can be used more than once. Simply leave them in the bottle and refill the next time you want to use Plantastic! However, if you want to leave a very valuable plant while on an extended vacation, we recommend that you use a new Flo-disk. Each Plantastic! comes with three Flo-disks which provides at least six uses, more than a one year supply for the average vacationing plant owner. Q.How long does it take to empty the bottle? A. This depends somewhat on the quality of your tap water. It normally takes about an hour for the flow to begin after filling, and from 10 to 20 days to fully empty the bottle (At a rate of about 1.5 ounces per day). Remember, this slow release allows all of the water to be retained in the soil with no runoff, so that the water is ready for absorption when the plant needs it. This enables the plant to stay green and healthy for many days after the bottle is empty. Q. Can Plantastic! be used for regular watering, as well as vacation watering? A. Yes. Just be sure to not overwater your plant. Refill the bottle no more often than every three weeks or so. Replace the Flo-disk when the bottle no longer empties completely. Q. Does Plantastic! work for all types of houseplants? A. Yes. Plantastic! has been tested on a wide variety of flowering and foliage potted plants, and found to be very effective in all cases. Q. How many Plantastic! watering bottles should I place in each plant container? A. Normally use Plantastic! one per pot up to about 8-10 inches in diameter. Very large pots may require more than one Plantastic! Your weather and plant variety can also affect the amount of water needed. Q. Can Plantastic! be used outdoors? A.Yes. It can work well in potted plants on patios, porches, pool decks, and in hard-to-water hanging baskets. However, remember that each bottle will only empty at a rate of about 1.5 ounces per day. So if your plant needs more than that to stay moist, a single Plantastic unit may not give it enough water. Because of the more severe heat and direct sun conditions which outdoor plants are often exposed to, you will probably need to refill the bottle more frequently than for indoor plants. 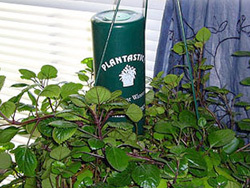 Use extra Plantastic bottles if the plants are exposed to direct sunlight, since these plants will require a lot of water.